Facebook is rolling “Watch” out to a limited number of people in the US. The official launch date to the rest of the U.S. has not been disclosed, but will precede international expansion. 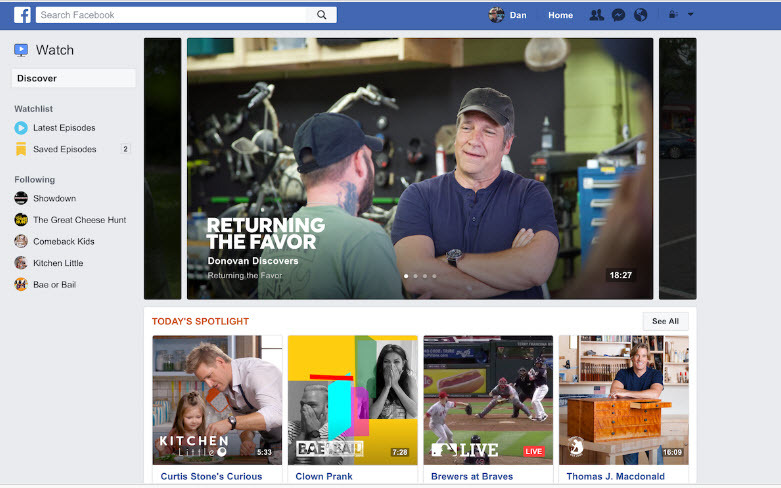 Users with access will see a TV-shaped Watch button in the bottom navigation bar of Facebook’s main app that opens the new video hub. While Facebook has offered video for years, it typically appears in the news feed when liked by friends. In this case, people can specifically seek video content and subscribe to it. The similarities to YouTube are obvious, but the usage of the Facebook platform is quite different, so success will require a behavioral change. Facebook admits that “we’ve funded some shows” as examples, but notes that these are only a small percentage of all the available shows. “We want any publisher/creator who is interested to be able to create a show in the future,” a Facebook spokesperson told Tech Crunch. “So there will be hundreds of shows at launch, and we’ll hopefully scale to thousands.” Original content developers will be compensated; earning 55% of associated ad revenue. Why It’s Hot: Alphabet seems unstoppable, with core offerings such as Google Search, YouTube, and less so, Doubleclick Ad Exchange, commanding a huge share of their respective categories. These platforms are not always marketer or agency-friendly. Their privacy policies are among the most restrictive. Their brand safety solutions are less customizable than others. Their technical support is notoriously slow to respond. Their products are limited and prices are high. Competition, even when offered by another media behemoth, gives marketers more options to test and may lead to positive changes at Alphabet/YouTube. This entry was posted in Emerging Tools & Tech and tagged Alphabet, Facebook, original video, revenue share, Video, watch, YouTube by kateclough. Bookmark the permalink.